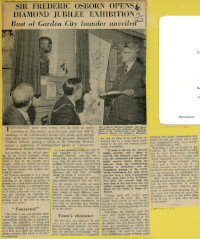 A damaged bust of the founder of the Garden City Movement, Sir Ebenezer Howard, is receiving a make-over by the Garden City Collection. Sophie Walter, our Collections Officer and a trained ceramics conservator, is cleaning and repairing an area of damage to the plaster bust, leaving it as good as new. 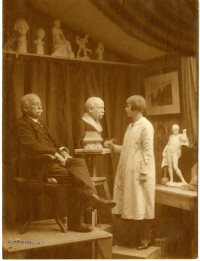 Although it is not known when or how the bust was damaged, it was created by Welwyn Garden City based artist Ivy Ruth Young, in 1926, when she was just 20 years old. 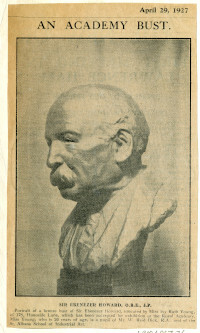 The bust was exhibited at the Royal Academy Summer Exhibition in 1927. 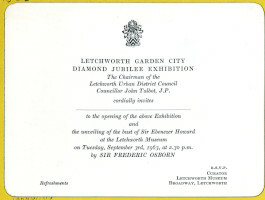 It was purchased from the artist by Letchworth Museum in 1963 and displayed at the town’s Diamond Jubilee Exhibition.